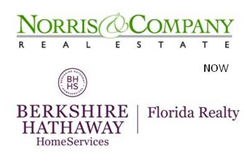 Berkshire Hathaway HomeServices, the real estate brokerage network operated by HSF Affiliates LLC, announced that Berkshire Hathaway HomeServices Florida Realty has expanded to Vero Beach and Indian River County with the addition of Norris & Company Real Estate. The transaction adds its REALTORS® and support staff to the statewide company and expands Brokerage’s presence in the Treasure Coast. We are proud to welcome them to our “Family of Services", commented Rei L. Mesa, president, CEO. Berkshire Hathaway HomeServices, the real estate brokerage network operated by HSF Affiliates LLC, announced that Berkshire Hathaway HomeServices Florida Realty has expanded to Vero Beach and Indian River County with the addition of Norris & Company Real Estate located at 3377 Ocean Drive, Vero Beach, FL 32963. The transaction adds its REALTORS® and support staff to the statewide company. For 45 years, Norris & Company has been recognized as the leading firm of premier upscale real estate in Indian River County. Since 1989, the company has been under the ownership of Gena Grove and Jane Schwiering, both long-time associates of the firm and long-time residents of Vero Beach. Under their esteemed leadership and collective vision, Norris & Company has enjoyed tremendous growth and success over the years. “Berkshire Hathaway HomeServices Florida Realty’s core values and vision are an excellent match for our REALTORS®. We are proud to join forces with Rei and the Florida Realty team,” Grove explained. Gena Grove and Jane Schwierings’ commitment to Vero Beach and the community remain strong as they continue with the company as a REALTORS® / Broker – Associates. The transaction represents Berkshire Hathaway HomeServices Florida Realty’s ongoing growth strategy following the company’s acquisitions of Realty Unlimited in St. Lucie County, Cristello & Company and Elite Preferred Realty in the Sarasota and Lakewood Ranch areas, Main Street Realty International in Orlando, and new branch office locations in Palmer Ranch in Sarasota and the opening of Winter Park in Orlando. Berkshire Hathaway HomeServices Florida Realty has over 39 offices and more than 1,750 sales professionals serving 18 counties throughout Florida. The full-service brokerage, founded in 1999, is a wholly owned subsidiary of WCI Communities, Inc. Berkshire Hathaway HomeServices Florida Realty is ranked fifth in the Berkshire Hathaway HomeServices network and is the overall No. 1 fundraiser for The Sunshine Kids Foundation, having generated more than $3.1 million. Visit http://www.BHHSFloridaRealty.com. Berkshire Hathaway HomeServices, based in Irvine, CA, is a real estate brokerage network built for a new era in residential real estate. The network, among the few organizations entrusted to use the world-renowned Berkshire Hathaway name, brings to the real estate market a definitive mark of trust, integrity, stability and longevity. Berkshire Hathaway HomeServices now accounts for more than 42,000 agents and nearly 1,200 offices in 47 states. Irvine, CA-based HSF Affiliates LLC operates Berkshire Hathaway HomeServices, Prudential Real Estate and Real Living Real Estate franchise networks. The company is a joint venture of which HomeServices of America, Inc., the nation’s second-largest, full-service residential brokerage firm, is a majority owner. HomeServices of America is an affiliate of world-renowned Berkshire Hathaway Inc.